El Born is not an isolated district as it is in facts located within the old part of the city and is one of the best known and liveliest neighbourhoods in Barcelona both by night and day. In the evening it is a fantastic area to enjoy a beer at one of its many cobblestoned, bar terraces and later perhaps a Margarita cocktail at a livelier bar! El Born houses the Ciutadella Park which is one of the most beautiful green areas in the city and where both the Catalan Parliament and the city’s zoo can be found. It is a fantastic place to relax, hire a rowing boat, or even catch a live concert in the summer months. 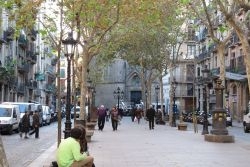 The Passeig Lluís Companys with the Arc the Triomf at the end is always full of people promenading up and down. With a typically old-world feel, the streets and pavements are narrow and lined with tall buildings, allowing for an authentic atmosphere just a short walk from the busier areas of Les Rambles. 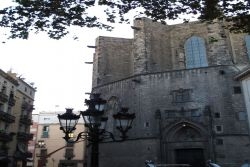 The impressive medieval church of Santa Maria del Mar is located in this area. One of the main thoroughfares in El Born is the street El Passeig del Born dotted with wine and tapas bars and a few exclusive boutique style shops. 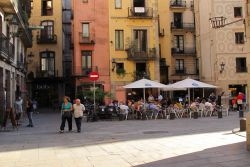 This particularly artisan area of Barcelona often has street musicians playing a variety of music to accompany your visit and it is certainly worth spending a good few hours of your time exploring this part of the city. In addition to this, discover the old medieval palaces housing quaint hotels, cafes or museums.